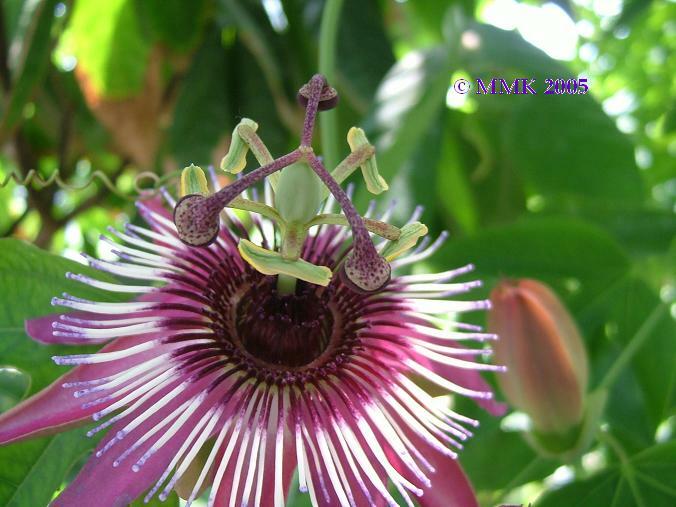 The passion fruit vine is a shallow-rooted, woody, perennial, climbing by means of tendrils. The alternate, evergreen leaves, deeply 3-lobed when mature, are finely toothed, up to 20 cm long, deep-green and glossy above, paler and dull beneath, and, like the young stems and tendrils, tinged with red or purple, especially in the yellow form. A single, fragrant flower 5-7.5 cm wide, is borne at each node on the new growth. The bloom, clasped by 3 large, green, leaflike bracts, consists of 5 greenish-white sepals, 5 white petals, a fringelike corona of straight, white-tipped rays, rich purple at the base, also 5 stamens with large anthers, the ovary, and triple-branched style forming a prominent central structure. The flower of the yellow is the more showy, with more intense colour. The nearly round or ovoid fruit, 4-7 cm wide, has a tough rind, smooth, waxy, ranging in hue from dark-purple with faint, fine white specks, to light-yellow or pumpkin-colour. Within is a cavity more or less filled with an aromatic mass of double-walled, membranous sacs filled with orange-coloured, pulpy juice and as many as 250 small, hard, dark-brown or black, pitted seeds. The fruit is cut in half and the pulp eaten with a spoon or scooped out and mixed in salads and desserts. Passionfruit juice is also very popular. The purple passionfruit is subtropical. 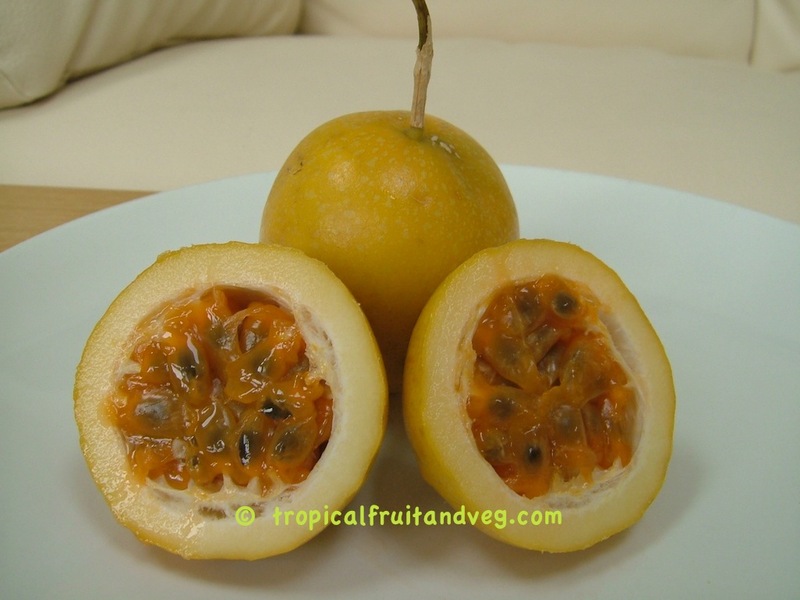 The yellow passionfruit is tropical or near-tropical. Both forms need protection from wind. Passionfruit vines are grown on many soil types but light to heavy sandy loams, of medium texture are most suitable, and pH should be from 6.5 to 7.5. If the soil is too acid, lime must be applied. Good drainage is essential. Passionfruit vines are usually grown from seeds. With the yellow form, seedling variation provides cross-pollination and helps overcome the problem of self-sterility. If planted soon after removal from the fruit, seeds will germinate in 2 to 3 weeks. Cleaned and stored seeds have a lower and slower rate of germination. Sprouting may be hastened by allowing the pulp to ferment for a few days before separating the seeds, or by chipping the seeds or rubbing them with fine sandpaper.